Lyrics in sung original languages (Spanish in Balada), English and Finnish translations. Rubáiyát (2015) is a song cycle based on the poetry of Omar Khayyam (1048–1131). The work was written for Gerald Finley who in this recording sings the solo part of the orchestral version of the work. Balada (2014), based on texts by Lorca, is a large-scale work for tenor, mixed choir and orchestra. Tenor Mika Pohjonen sings as the soloist. This cantata was premiered in Madrid in May 2015. Into the Heart of Light (Canto V; 2012) is the composer’s latest installment in a series of works for string orchestra that share the title Canto. Rautavaara wrote the first of his Cantos in the 1960s, and each piece in the series have represented well the latest stylistic developments by the composer. 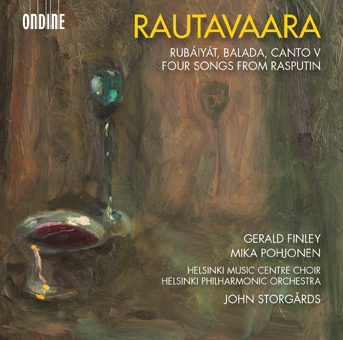 The concluding work of the recording is Four Songs from the opera Rasputin. These dramatic songs were arranged by the composer for mixed choir and orchestra in 2012. In the last two decades the Helsinki Philharmonic Orchestra - conducted in this present recording by John Storgårds - has released several award-winning recordings of the music of Einojuhani Rautavaara.